I love making my own soap! Besides the well-known fact that commercially made "soaps" are filled with toxins that may contribute to cancers, estrogen/other hormone issues, and skin sensitivities, I just love the creativity of making my own SAFE soaps just the way I want! When you make your own soap, you get to decide which herbs, essential oils, clays, and exfoliants to use (or not). You get to decide the "mood" of your soap. You get to decide on the color, scent, and how you want it to feel on your body---and all in safe, natural ways. I used Chamomile to make this soap by infusing it in the water I used for the lye solution. Chamomile is an extremely soothing herb for your skin. I even use this on my face! Because the infused Chamomile turns the soap a beautiful golden light brown color, you don't even need to worry about adding additional herbs or clays for color (unless you want to, of course). How to make chamomile infused handmade hot process soap. Complete directions with pictures! You can use this recipe for either cold process or hot process soap making. If you have never made soap before, or are new to the process, you should read through a few detailed tutorials to be sure it all makes sense. The Everything Soapmaking Book is comprehensive and easy to read! By far the most important thing about making your own soap is safety. Making handmade soap is potentially very dangerous, and the caustic nature of the ingredient (sodium hydroxide--lye) used to saponify the oils into soap must be completely respected at all times! Click the image for a great soap making resource! **I purchase my organic olive oil at Costco. It's the best price overall. The coconut oil there is not priced too high either. **For soap making, I purchase essential oils in a bulk form, which is much different than I do the oils I use directly on my skin. However, and luckily, Starwest Botanicals offers great prices on bulk essential oils. ***SCENT: This recipe makes about three pounds of soap, and I like my soaps scented. I put "parts" on the essential oils in case you want to only add a small amount (like an ounce total) to the whole loaf. In my case, I usually add between 2 and 3 ounces of essential oils, so you can make adjustments as you like. If you keep the ratios of the essential oil blend above, you will have a really clean, fresh and uplifting scent for your soap! Want to make your own natural soap the way YOU want it? Or begin experimenting with hot process soap? You'll learn everything in my eBook so you can start creating! 7) Kitchen Scale for measuring--you need to be precise with soap making. If you are making hot process soap, you will need a large basic crock pot instead of the stirring bowl you would use in cold process. Here is the Chamomile infusion all ready for the lye! 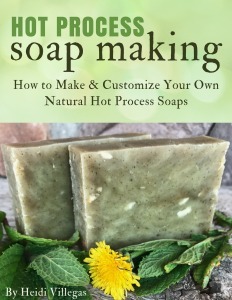 NOTE: You’ll want to snag my Hot Process Soap Making Checklist & Basic Instructions over in the Healing Harvest Homestead free resource library! It will help keep your soap making on track so you don’t miss a step! Just fill out the form at the end of this article. Infuse the Chamomile flowers in a quart Mason jar by pouring just boiled water over the flowers and allowing to steep until the water is cool. Strain the liquid out, and you'll have lovely golden chamomile tea for your soap. While the Chamomile infusion is cooling, get your oils melted together, either in your crockpot or over the stove. Be sure the heat is set to low---you don't want your oils getting too hot, either way. Measure out your water into a heat resistant pitcher/container. Then pour in your lye beads. NEVER pour water into the lye! ALWAYS pour your lye powder/beads into the water. You could end up with a dangerous volcano by pouring the wrong way! Allow your lye solution to cool down. If you are making cold process soap, you need to pay attention to the temperatures of both the oils and lye solution. For hot process soap making, you don't need to worry too much about temperature, but I still don't like my oils or solution super hot when I start. Here are two lye solutions cooling down. The one on the left is the Chamomile solution. The clear one on the right is what lye solution looks like with no additives. I usually make two loaves of soap at a time, and that's why both of these are going! Whether making cold or hot process soap, you'll need to grab that hand blender now, and stir, stir, stir until your mixture turns into a type of thick batter called "trace." You'll see peaks form, like in a pudding, when you have reached the right consistency. This is where the "cook" happens in the crock pot. You'll actually be cooking out the lye solution and liquids using heat, while the batter turns into soap right before your eyes! What you'll be left with is a lovely translucent, waxy VERY hot batch of soap, ready to press into your soap mold. For the hot process method, you add your essential oils at the very end, when you are sure the soap is ready. I turn off the crock pot and let everything sit for a few minutes, just to let it cool down some. This helps keep the essential oils from being damaged. Press it in, let it sit until cooled. Then simply remove it from the mold, cut it into bars, and enjoy your soap! You can use hot process soap right away because it is no longer caustic. All you're left with is natural glycerin, a wonderful humectant, and your lovely, lathering soap! Once your soap has reached trace, you can stir in your essential oils. Pour your batter into your prepared soap mold. Be sure to follow directions for the type of mold you purchase. Cover the soap with a towel and set aside for 24 hours. After 24 hours, you can remove it from the mold and cut it into bars. DO NOT USE YET. The bars will have to "cure" for anywhere from 4 to 6 weeks to make sure they are no longer caustic. Here’s a complete guide, recipe variations, and lists of herbs, clays, and essential oil blends so you can make your own hot process soap! Lots of pictures show you the way! Here we are! Two whole loaves of beautiful, natural, handmade soap! That's all there is to it! It's quite a process, but once you've made your own soap a few times, it's simple! I hope you enjoyed this little recipe and that you'll give it a try! Thanks for stopping by! Please let me know if you have any questions, comments, or experiences you'd like to share! Apr 18 Chamomile Ale (Beer) Recipe---Create Your Own Herbal Home Brew! Dec 18 Hot Process Soap: How to Layer Two Colors Together, Just Like Cold Process! Beautiful!